BIRTHDAY WISHES", to our 'Gandharvan', who is celebrating his special day on 10th January: the one who is blessed with the inimitable voice that is tuned by God Himself -- perhaps the answer to the question in one of his songs, Parayu Nin Ganathin Madhurima Engane Vannuu?! Something special happens even when he sings very ordinary songs: words come to life and songs become classics, writers and their lyrics reach immortality through his voice, music directors become legends and listeners are blessed! 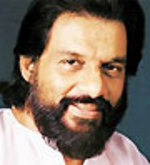 Yousafali Kecheri has written the poem, Yesudas, and has dedicated a song, �Thenanu Nin Swaram Pattukara, Poovanu Nin Manam Koottukara�; even the great Vayalar Rama Varma has written a song for his, Yesu, which show the greatness of this Musical Legend! �Please know that we all love you and that you are a big part of our lives for now, and always. Most of us wake up to your voice and it�s your voice that we hear before we go to sleep at night! You are with us in our moments of happiness, celebrations, sadness, and any other moment that one can think of�. �May all your dreams be showered with Celestial blessings and may you reign Forever".